You just can't wait for a wonderful camping experience, right? Here's what you should consider for your perfect camping hammock: Yes4All Lightweight Camping Ham..
Army Green 2 Person Hanging Hammock Bed With Mosquito Net Parachute Cloth Hammock Features: Parachute nylon fabric material can hold the weight up to 300kg.W.. This Hodedah folding bed is a convenient space saving addition to any home. Constructed with a sturdy, durable metal, this bed is sure to last a long time. The ..
School Specialty Toddler Stackable Kiddie Cot measuring 40 in x 23 in x 6 in is featured with sturdy corners that are a full 6 in off the ground, to permit prop..
North West Survival hammock is a light weight breathable hammock weighing a total of 14 ounces! 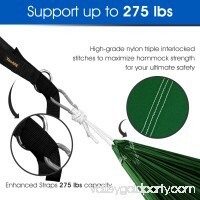 Every parachute hammock comes with an attached pouched which all.. If you've tried to climb into a sleeping bag on a hammock, you'll know what a strle it can be! 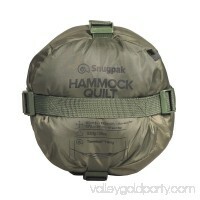 The Snugpak Hammock Quilt is designed to keep you warm and comfor.. This Equip Two Person Travel Hammock has plenty of room for two or keep it all to yourself and relax in ultimate comfort. 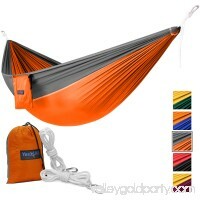 This portable hammock packs convenient..
Made of quick-drying parachute nylon, this hammock is mildew and rot resistant. 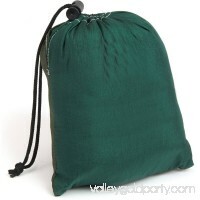 Weighs just 19 ounces and is foldable to fit into a small attached stuff sack (e.. Features: -Stackable, interlocking, space-saving kiddie cots are ideal for daycare center, home and classroom. -Constructed with 16 gauge powder-coated steel po.. Item specifics: Brand new and high quality Durable, colourfast and portable Easy to be cleaned and dry quickly after being wet.The hammock is made of parac..
Are you looking to purchase a badass camping accessory to enjoy an outdoor moment with your family? Yes4All Lightweight Camping Hammock With Tree Straps & Carry..
Lightahead Camping Hammock With Hammock Tree Straps, Portable Parachute Nylon Hammock for Backpacking travel. High Quality Hammock with Silky soft feeling, stro.. Your camping can be fun and relaxing with the Yes4All Lightweight Camping Hammock with Carry Bag (Double). Its breathable Nylon parachute construction is a must..